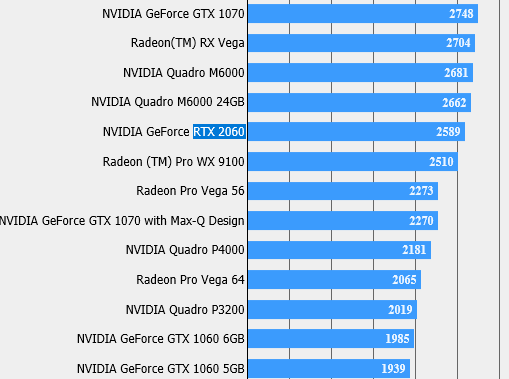 The NVIDIA GeForce RTX 2060 has made an appearance in the Final Fantasy XV benchmarks. This is probably the first sighting of the card in the wild and according to this benchmark, the RTX 2060 seems to perform somewhere between the GTX 1060 6 GB and the GTX 1070 inline with expected generation-to-generation improvements. We have reported that NVIDIA has no plans of releasing the GeForce RTX 2060 anytime soon owing to the surplus stock of GTX 1060 cards but that hasn't stopped the RTX 2060 from showing up in benchmarks. The card just reared its head in the Final Fantasy XV benchmark and posted a score of 2589 placing it somewhere between a GTX 1060 6 GB and a GTX 1070 at 4K High Quality. We'd suggest taking Final Fantasy XV benchmarks with a grain of salt but the numbers do seem to add up. It trails behind the Radeon RX Vega 64 (2,704 points) and has about half the score of an RTX 2080 (4,880 points). We also see a ~30% improvement over the GTX 1060's score (1,985 points), which is inline with the expected generational upgrade. Details about the RTX 2060 are still scarce. Initially, it was thought that the RTX branding would be restricted only up to the 2070 but now, all references so far point to RTX trickling down to mid-range cards as well. Now RTX does not mean just ray tracing alone so this could imply support for DLSS via Tensor cores rather than actual ray tracing. However, a TechPowerUp spec sheet shows the RTX 2060 as having 195 Tensor cores and 24 RT cores so in all probability, it could just be a scaled down RTX 2070 (288 Tensor cores; 36 RT cores). 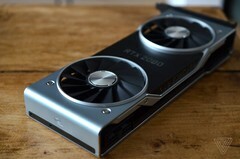 Even if the 2060 does indeed have RT cores, it remains to be seen what advantages it would bring as even the flagship RTX 2080 Ti sees massive performance drops with RTX on. Pricing is another aspect, which NVIDIA needs to get right if it has to avoid another stockpile.